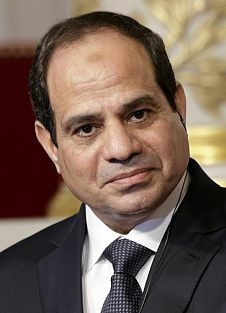 Former Field Marshal Abdel Fattah Saeed Al-Sisi was sworn into office as President of Egypt on 8 June 2014, having earlier that year resigned from his post as the Commander in Chief of the Egyptian Armed Forces. Army: Sisi first came to public attention when then President Muhammed Al-Morsi of the Muslim Brotherhood retired the head of the Supreme Council of the Armed Forces ( SCAF) Mohamed Hussein Tantawi and promoted Sisi to take his place; to serve as the Commander-inChief as well as Minister of Defence in Morsi’s new cabinet. A Coup: On June 30 2013, millions of Egyptians again took to the streets in large numbers demanding that Morsi step down. The military apparatus led by Sisi removed Morsi from power and banned the Muslim Brotherhood. Morsi supporters believed that the coup violated a democratically legitimate government. Outbreaks of violence ensued across Egypt that included the death of many hundreds of protesters at the hands of pro-military police at Raba’a Al-Adawiya Square in Cairo.